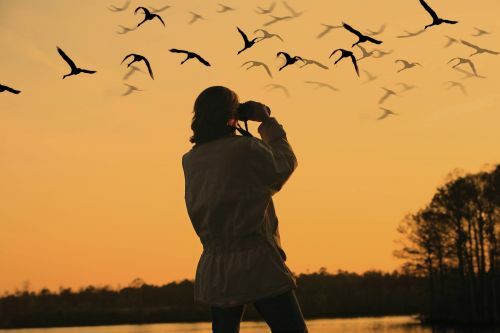 Robin Sowton will talk about what you need to get started birding in the D/FW area (type of guides and binoculars), how to approach bird identification, some common beginner challenges, local field trips and birding groups that you can join, keeping life lists, using Ebird, and how your notes can help research with climate research and other subjects. She'll also talk about why Texas is one of the best places for birding. David Griggs will tell how Sierra Club members work together to set goals, and will talk about some of this year's accomplishments. Everyone is welcome. You don't have to be a Sierra Club member. Just show up. We'd love to meet you. Our General Meeting starts at 7:00 pm but come at 6:30 for snacks, information and fellowship. Our meeting takes place at REI, 4515 Lyndon B Johnson Freeway, Dallas, TX 75244. Click over to our General Meeting page of our website for more information and a map. Our annual Holiday Party will be held at El Fenix Restaurant at 255 Casa Linda Plaza. We'll party on Sunday, December 15 from 6:00 pm until 9:00 pm. Here is a Google map. Club members and guests will share the holiday spirit, some great Mexican food, and the company of others at this annual event. Join us for some camaraderie, door prizes, silent auction, and perhaps some surprise speakers, you never know. We'll celebrate some of our outstanding volunteers and have plenty of time to mingle. There's bound to be talk about issues of the day -- air, water, veganism, fracking, coal, nuclear, whatever strikes your green fancy. The entire menu will be available so you can order whatever you want to eat or drink, including liquid spirits. We'll provide a free round of margaritas. Support the Club by getting a 2014 Sierra Club Calendar or Planner!. Invite your family and friends. So come on out for a great party, low price, no clean up, and lots of like minded people. What could be better? See you there, and bring your appetite. Happy Holidays!! You have all seen or heard the pro-fracking ThinkAboutIt.org commercials that have been running recently, including on National Public Radio. Now you have a voice to counter these ads. NPR's pro-fracking ads are disgraceful because those commercial messages are clearly not in the best interest of society. When a trusted news source broadcasts a message, even as a commercial, it is difficult for the public to differentiate between unbiased news and slanted commercialism. A campaign is underway to change what we hear on NPR by recording a short message telling NPR to drop the fracking-sponsored messages that are misleading millions of its loyal listeners every day. The best messages will then be compiled into a radio ad, which will be run on NPR stations across the nation. If you would like to join this campaign, call (617) 863-NPR0 to record your own 90 second message. Make sure to include your name, the name of your local NPR station and the phrase "NPR Don't Even Think About it" in your recording. Please take a few hours out of your busy holiday schedule to help clean up one of our favorite parks. Our White Rock Lake cleanup weekends need your help. Here is our calendar for the next two months. For complete listings, visit us at www.dallassierraclub.org. The Executive Committee (or Excom) is the elected governing body of the Dallas Sierra Club and meets at REI, 4515 LBJ Freeway, Farmers Branch, TX 75244 (north side of LBJ between Midway and Welch) at 5:30 pm. Contact the Dallas Group Chair for more information. Robin Sowton will talk about what you need to get started birding in the D/FW area, and David Griggs will talk about our Club's 2013 goals and accomplishments. Everyone is invited to the Dallas Sierra Club's General Meeting. Full details are on our home page now. The Executive Committee (or Excom) is the elected governing body of the Dallas Sierra Club and meets at REI, 4515 LBJ Freeway, Farmers Branch, TX 75244 (north side of LBJ between Midway and Welch) at 6:30 pm. Contact the Dallas Group Chair for more information. Solar Power for Homeowners Learn about adding a solar energy power system to your home. Plano Solar Advocates will demystify getting a PV system installed on a homeowner's roof. Chris Guldi will share the results of leasing a solar power system for her house. Everyone is invited to the Dallas Sierra Club's General Meeting. Full details will be on our home page about a month before the meeting. Our annual Holiday Party will be held at El Fenix Restaurant at 255 Casa Linda Plaza. We'll party on Sunday, December 15 from 6:00 pm until 9:00 pm. Here is a Google map. Club members and guests will share the holiday spirit, some great Mexican food, and the company of others at this annual event. Join us for some camaraderie, door prizes, silent auction, and perhaps some surprise speakers, you never know. We'll celebrate some of our outstanding volunteers and have plenty of time to mingle. There's bound to be talk about issues of the day -- air, water, fracking, coal, nuclear, whatever strikes your green fancy. The entire menu will be available so you can order whatever you want to eat or drink, including liquid spirits. We'll provide a free round of margaritas. Support the Club by getting a 2014 Sierra Club Calendar or Planner!. Invite your family and friends. So come on out for a great party, low price, no clean up, and lots of like minded people. What could be better? See you there, and bring your appetite. Happy Holidays! !